Every time I’ve suggested going to Sweden, my husband Tom thinks of an alternative. “I’d rather stick a fork in my eye,” or “Don’t you think I’ve had enough of Swedes?” OK, Tom, I get it. You’re married to me and I’m half Swedish. We’ve lived our adult lives in Minnesota, which has more than its share of Scandinavians. You constantly remind me you left Minnesota to avoid the cold winters and dark days. You’ve read Strindberg. And you like teasing me. But I’m obstinate (which Tom considers synonymous with Scandinavian). It’s spring, and we’re going to Sweden, where my grandfather, Nels Edward Henning, was born. And still, I’m mostly unprepared for any sort of ancestry hunt, and confident I won’t meet up with any relatives. I’m the sole survivor of my immediate family, and I have no expectations of expanding my Henning relations. I just want to see the place my grandparents came from. All I knew going in was that my father, Earl, was my Grandpa Nels’ youngest, and that Grandpa came to the United States at age 17 or 18 from the southern Swedish region called Skåne. Of my father’s siblings, one brother, Norm (97), is still living. One of my cousins visited Sweden in 1959, making and eventually losing contact with a great uncle. 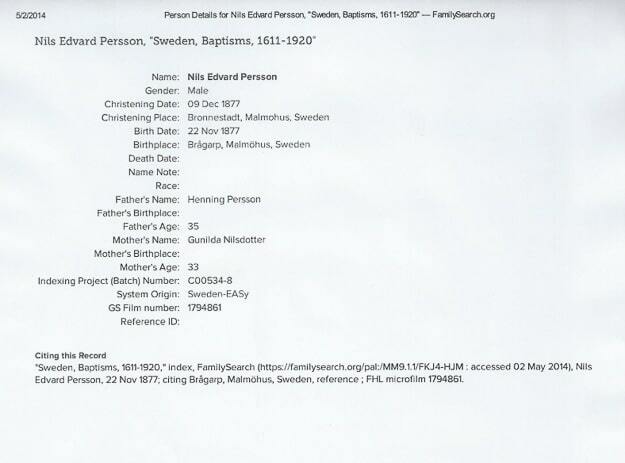 Another cousin’s husband has been working on Henning ancestry recently, and provided me with the nine baptism records for my grandfather and his siblings. All together, that meant I knew the names, birth years, and christening place (Brönnestad), of my grandfather (christened Nils Edvuard in 1877) and his eight siblings. These nine were the children of Henning Persson and Gunilda (also spelled Gunilla) Nilsdotter, my great-grandparents whose marriage was 13 September, 1867, also in Brönnestad. Christening record for Nils Eduard (Henning), Kris’ grandfather. The tourist office staff looked up Brönnestad and told me it was in Germany. Google maps displayed it in two different counties in Sweden. So Tom sought out the Archives office, and there we met Suzanne. Lucky for us, Suzanne, in Malmö’s archive office, had a few minutes to show us around the available websites for family searches, and confirmed that we were headed in the right direction. The first tool Suzanne used was www.arkivdigital.net. 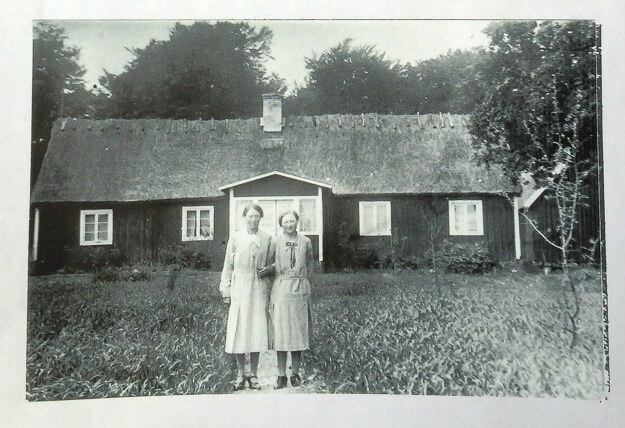 She discovered the property Henning Persson owned in Horröd, and was able to translate for us that Henning was a successful farmer. She described Horröd as just up the road, through the woods, a couple kilometers from Brönnestad. That made sense. And she gave us the house number: Horröd #1, meaning it was probably at the crossroads. Getting warm, but nobody home. We booked a B&B in Brönnestad, rented a car, and with one really great stop at Bosjokloster (more on that later. Hint: we met a Count), we arrived in Brönnestad around 2 p.m. It’s only an hour drive north of Malmö. We didn’t bother to drop our bags, and in under ten minutes, we were at the crossroads of Horröd, wondering which farm could be owned by descendants of Henning and Gunilda Persson. I couldn’t go knock on door Number One. The mailboxes and house numbers were now three and four digits long, plus letters. Still, there were only a dozen or so houses within sight. At this point, I’m thinking my cousin Missy (the only kin I know to have visited Sweden) would be proud, since together we’d approached our grandparents’ homestead in St. Cloud (Minnesota), years after the house had passed on to others. Or maybe I was wishing Missy was there to march forward and knock on random doors ahead of me. 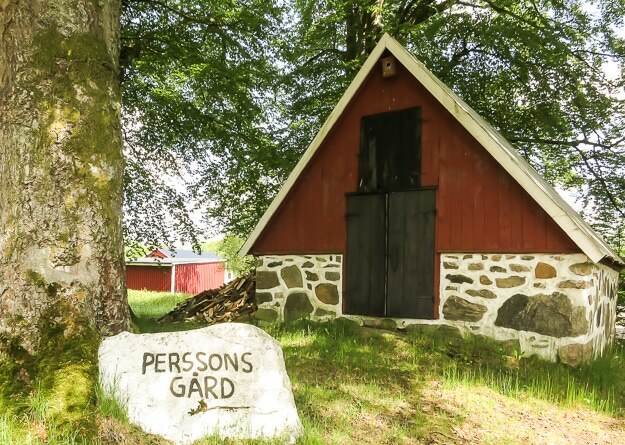 We drove down the dirt road, dodged a heavy tractor and a logging truck, turned around, drove up the road, and pulled into a promising looking property called Persson’s Gard. A small stone structure, half below grade, was probably a home or stable or both. It looked old enough, and the name was enticing, if not misleading. Beyond were several beautiful pastures, horses, handsome outbuildings, and a residence under construction. No one was home, but I had a nice chat with one of the horses. At the next house, I knocked on the door next to the parked car and bicycle. We waited, hearing hurried footsteps. A teen-aged girl opened the door, but she knew nothing about the farms, the neighbors, the Henningssons, nor the Perssons. She did admit she’d been lying out in the sun. Any respectable Swede would do the same on this sunny day. 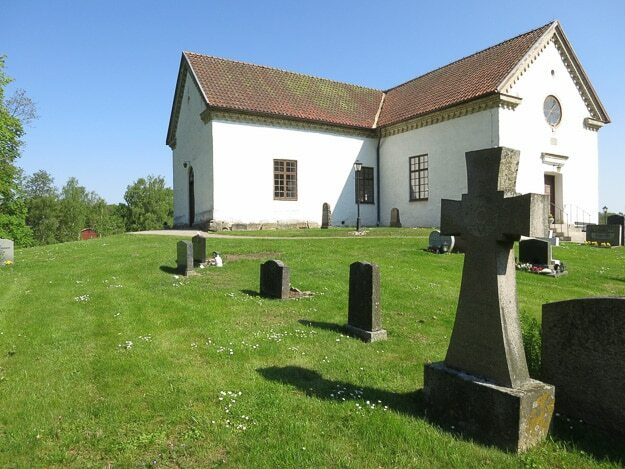 Church with cemetery in Bronnestad. I still didn’t really have my rap down. At the third place I tried to explain the purpose of my visit, but this woman knew nothing and didn’t want to guess which house or farm in the village might be the oldest. She hollered to her old man, who apparently didn’t know either. She was either a little afraid of me or didn’t want the cat to run out. The door was barely open, and I was losing courage. I looked at my notes with the names of my great aunts and uncles. Nils Edvuard, son of Henning Persson. He would be named Henningsson by the time he left home. Of the nine children (Nilla, Hilda, baby, Nils, Emma, Frans Henrik, Fredrik Johannes, Carl Hugo, and Adla), some must have stayed in the area. But then, that was a long time and three generations ago. OK, just one more try, I thought. I checked the mailboxes. 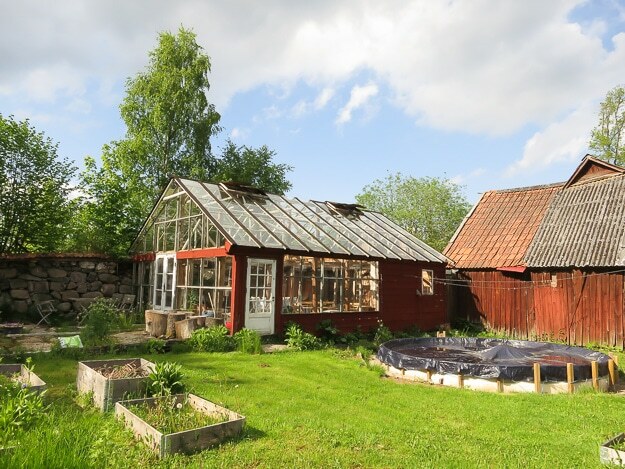 That revealed nothing, but some passersby, who had only lived in Horröd for three years, suggested I check with the folks a couple houses over because they’d lived there since the ‘50s. A new lead. Behind the house, a sweet-looking woman was sitting outside in the sun, and someone else was in a giant tractor between big, parallel barns. When I approached, she looked nervous and confused. The little guy hopped down from the tractor and explained, in non-stop Swedish, that she’d had a stroke. I started over, mostly saying names, Persson, Henning, Henningsson. “Ah, ja, ja, Henningsson, ja!” he said. Another stream of Swedish. By his motions and inflection, we gathered he was telling us that he knew of Adla (also Edla) Henningsson, and knew which house was hers. Of course we answered in English as if we understood. But we all knew the chances of our getting to the right place were nil. I showed him the list of siblings, and he recognized Carl Hugo, too. He was a professor or doctor who came around regularly to visit Edla. So this kind guy, Unø Thillgren, the only person in Sweden I’ve met who speaks not a word of English, came up with a plan. First, he biked over to the neighbor’s (Monika), and brought her back to translate. After listening to Monika and Unø, not understanding, laughing at our peculiar situation, and getting snippets translated for us, we realized the old man did indeed know the youngest of my grandfather’s siblings. Yes, he chatted on, Edla was rich and kept her money close. I’m guessing ‘stingy’ is the word he used, and we all laughed. But on the bright side, he explained, she bought milk and eggs from her neighbors, and when she died she gave all her money to the church for medical research. Unø had another plan, which Monika helped explain. He’d hop on the giant tractor and we’d follow him to the Henningsson homestead so he could show us the actual house Edla lived in. (She’d died several years earlier, no children.) Then he’d lead us to someone else who might know more. Christer lets us play in the bell tower. Unø, back in the tractor, led us on the five-minute drive to Dan-Inge (Don) Olsson’s house, where English was sometimes spoken. 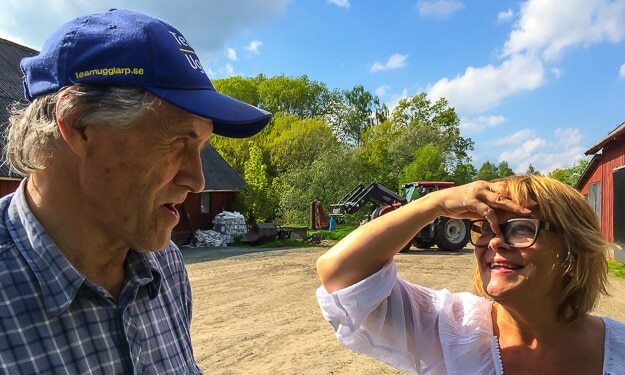 Agneta, Don’s wife, went into the house to get him, and Don kindly rallied from nap to offer more suggestions. His English was great but he didn’t know the family history. 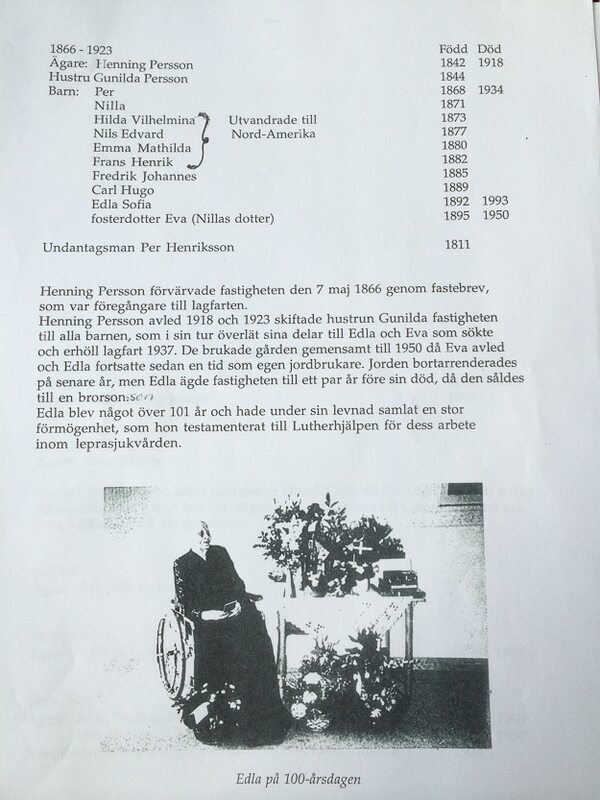 Agneta helped by fetching phone numbers and writing the names of possible sources for us. With Unø, they seemed to have a good time recalling Edla, or maybe chatting about something unrelated. We learned they’d hosted an American choir from Cleveland just days before. So it was like an American incursion into Horröd and Brönnestad. Unø took his leave now that we were in good hands. 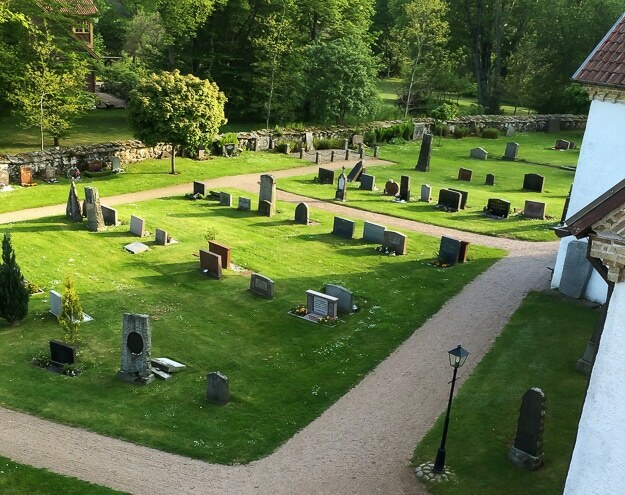 Armed with names and numbers, we headed to the cemetery beside the Brönnestad church, across the road from our B&B. We were confident we’d come across family graves. But it wasn’t that easy, and we were about to give up finding Henning Persson or his offspring, when the neighbor called over and asked if we wanted to see the church. This was Christer Halldin, one of the people to whom Don and Agneta had referred us! 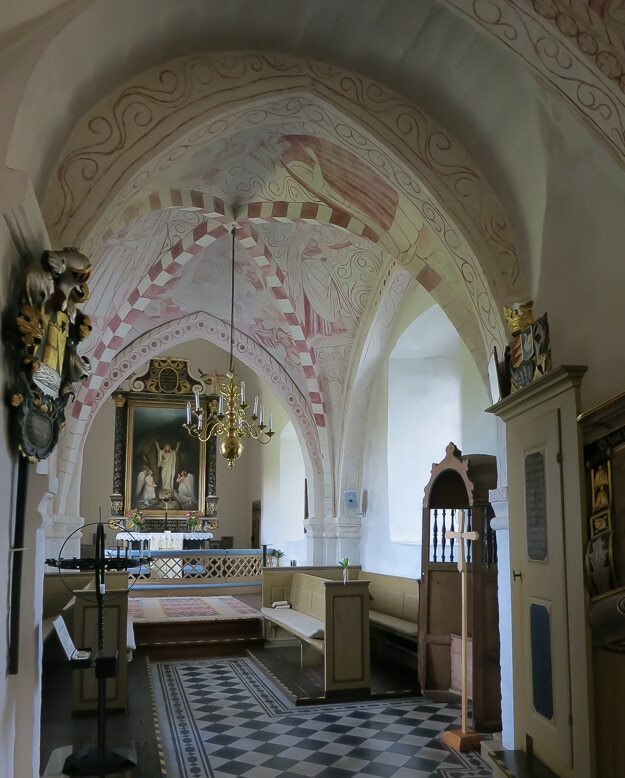 Christer and his wife, Christina, live in the vicar’s old house, a real beauty up the hill, and their responsibility, assigned or self-prescribed, is to manage the keys to the church. They were just the people we needed, about our age, and kind, funny, and helpful. Christina (nee Lind) grew up in a house we could see from the churchyard. She and her mother are the de facto historians on families and properties in Brönnestad and Horröd. Like Unø, she remembered meeting Edla. Both she and Christer, in excellent English, were enthusiastic about helping us find what we were looking for. We toured the church interior, read and talked about its history, and found cemetery records and a plot map. So I’d met two people who had met my great aunt. Christina showed us where Edla was buried, but I was disappointed not to find headstones. They’d been removed before they could topple over, and were being stored, Christina said, but we could have a look if we wanted. Yes, I wanted to see something concrete, or perhaps granite! 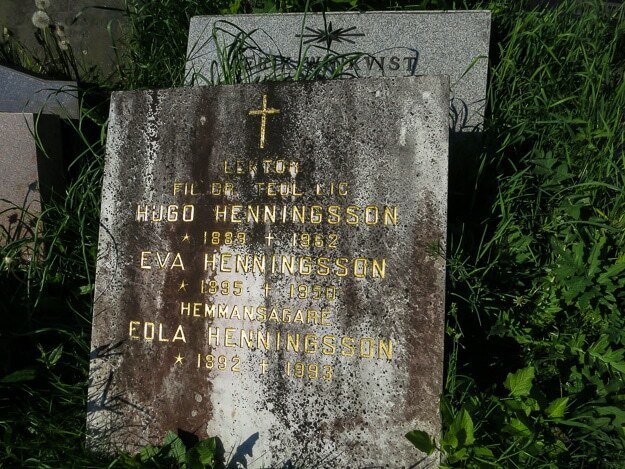 And there, behind the old schoolhouse next to the cemetery, on top of the stack, was the family headstone for Edla and her brother Carl Hugo, plus Eva Henningsson. Eva? Family graves and combined headstones are common, but I wasn’t sure how Eva fit in. The headstone dates jogged Christer’s memory, and he quickly turned to the plot entry for my geat-grandfather, Henning Persson. Henning (my name!) was buried there in 1918, the same year Suzanne of Malmö Archives had told me he’d died (and the same year my father was born). Even though there was no headstone for Henning Persson, we could establish the burial place from the plot maps. This was the place, and there was a direct line. I didn’t need to be distracted by all the Perssons and Nilssons and others. This Henning and these Henningssons were mine, or I theirs. 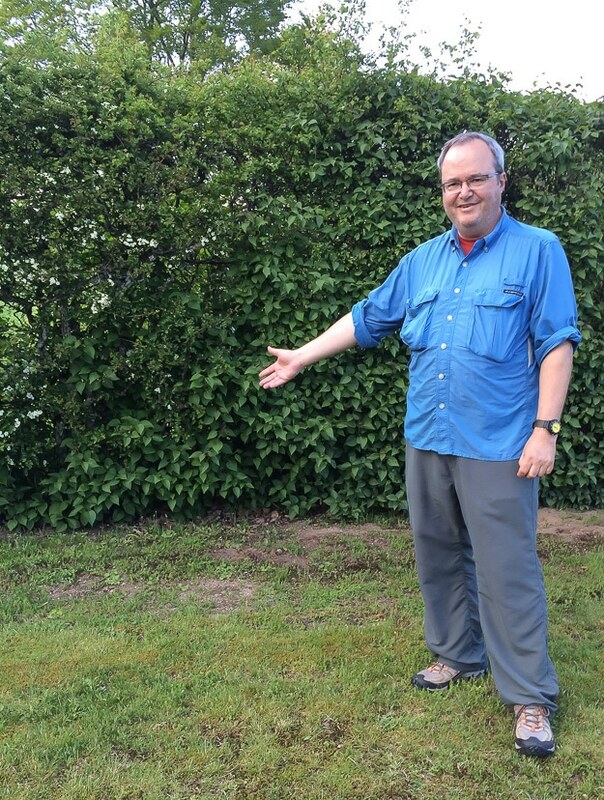 No headstone, but according to the plot map, this is the burial spot for my great-grandfather Henning Persson. 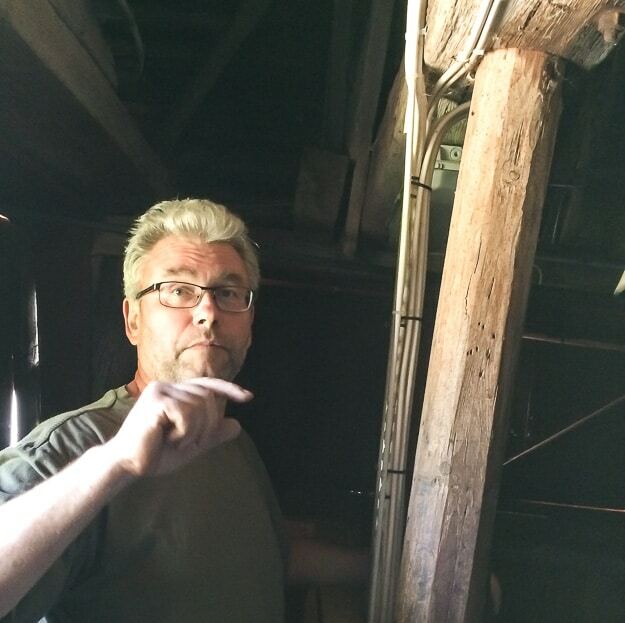 While Christina went to the house to look for documents about Horröd, Christer let us climb up into the original bell tower. (The church was too poor to attach it to the church, as many places did after big cities started the trend.) I felt like a kid in my grandmother’s attic. Christina came back empty-handed, but we were satisfied nonetheless. About three hours later, after dinner, Christer came rushing into our B&B with records of Henningsson Horröd landholding, plus names of children and copies of pictures of Edla with family in front of the house. We learned Eva was a niece to Edla, that a foster boy was part of the mix (not unusual in those days), and that the land was no longer in the family. Three others, besides my grandfather, went to the U.S. but I don’t know if my Grandfather Nels ever saw them again. Edla was a proud landowner who lived to be 101. And Hugo was, in fact, a professor with a PhD. Christer translated quickly for us before hurrying out. There was a hockey match to watch. Brönnestad Kyrka, where my grandfather was baptized. Despite our haphazard methodology, we had managed to find some family graves, and a couple people who remembered a relative. During the day, I felt alternately elated and connected, then dissociated and forlorn. It was fascinating to put pieces together, and frustrating to know so little of my family. The reward was hearing the Skåne laugh and the lilting accents. To see the spring-green fields, the woods, the rocky knolls and outcroppings. I loved hearing ‘Yune’ for June and ‘yoke’ for joke. I was not sorry to impose on these strangers. It all looked and sounded so familiar. These were strangers helping me, but they were MY strangers, and it was eerily familiar. And just eery. -The birthplace,’Brågarp,’ remains an unknown quantity. Gunilla was born in Gualov, Kristianstad, the current county seat of Brönnestad. -The son, Per, shown on this record, I gathered was a foster child. It wasn’t uncommon, apparently, for Finnish refugees to join and work for Swedish families. One baby (female) appears to have died at birth in 1876. -Other records show the transfer of land in the 20th Century. Kristin, Kudos to you for even trying. I think most people are afraid to ask questions where they really aren’t sure what to ask. Even if you didn’t “meet” any of your relatives, you got to see and hear the place they lived…I think that is pretty cool. Again, kudos. Thanks so much, Corrine. It probably wouldn’t have happened without Tom’s encouragement and a little jump start by extended family. It’s amazing to imagine all that has come before. Don’t you love the amazing people you meet when traveling? Your adventure in tracing your family origins was fun to read about and I hope your husband got caught up in the spirit of the quest -otherwise, he’s a very patient man! Yup, Anita, you are right. And Tom may not always be patient, but as he said, he likes to solve a mystery as much or more than the next person! Such a wonderful and heartfelt experience you have shared! Thanks, Sandy. Let’s do discovery trip part II together. Tracing the ancestors was and is a very time consuming work in progress. After a few years, my grandmother asked me if I was finished. My answer was, “when I trace back to Adam & Eve, I’ll be finished. One elderly relative asked her husband, “why is she asking these things, they’re dead aren’t they? That’s the crux of it, Neva. No wonder I was feeling ambivalent. As 1/4 Swedish myself, I found your experience inspiring! Something I need to do…. Thanks, Susan. I’m checking out your Road Trips for Foodies site now. What a great adventure! I know how difficult it must have been to go from door to door, but worth it! Nancie, I’m lucky it was such a small town, er, rather…community. And even luckier we ran into the “gate-keepers” at the cemetery. Had we not, I’m not sure I would have made the phone call! Wow, we’d love to track our ancestors down. We’d have to start in Greece before heading over to Germany. Well done, you. Yup, these sorts of searches aren’t getting any easier over time. Both my parents were the youngest in their families, so I barely knew my grandfather, much less his siblings or my great grandfather! Goodness, a most amazing story – and told so well! A veritable “Who Do You Think You Are?” escapade. A most memorable and rewarding travel adventure. Nice to meet you, Dyanne. I’m looking forward to reading more of your blog. Tom’s blog was called Andean Drift, before merging it into Travel Past 50.
how rich these travels must have been for you! Thanks, Lisa, I just read your Abondanza post, but lost my comment trying to log in to WordPress. Oh well. Is that a resort as well as a restaurant? I think I would have had goosebumps the whole time I was there (if I were a Henning). I’m in the same “boat” (pun intended) as those other Ellis Island people. On my husband’s side, if we can trace his ancestry back to 15th century Spain, my son could perhaps obtain Spanish citizenship. Turns out they’re feeling a little badly about the Inquisition. Haha, boy I wish the Swedes felt guilty about something other than drinking. Swedish citizenship could cure our 90-day Schengen visa blues. It was a good adventure, Ron. Maybe this is a head-start on meeting some second cousins, eventually. In the meantime, it was great seeing the very land my grandfather had seen and immersed himself in as a boy. What a tale! And, what a great way to meet the local folks. I don’t have any relatives in Sweden that I know of, but always fun to dig into your roots. Mine are all in England and Ireland and a few are still above ground so I guess we had better get on over there and look them up. So glad you enjoyed the story, Nancy. It WAS a good way to meet people. By the way, another unexpected experience we had digging up relatives (not literally) was in Tasmania. They have a thorough database there of the (mostly) Irish convicts – including their supposed crimes. Tom found a relative sent away for stealing a handkerchief. What a great story. I’m glad you found the farm – I think there’s something about seeing the places your ancestors knew. I know a bunch of my Swedish family and have seen where my grandfather was raised, but I haven’t done well on the Danish side. I’ve found the town and the church, but didn’t get a lot of help at the church and fewer people speak English in rural Denmark. But you remind me I need to make another try at it – or try to find all of the information that a distant cousin put together that seems to have disappeared with her death years ago. (It seems like such a waste to have to redo it all!) Anyway, loved hearing about your adventure.